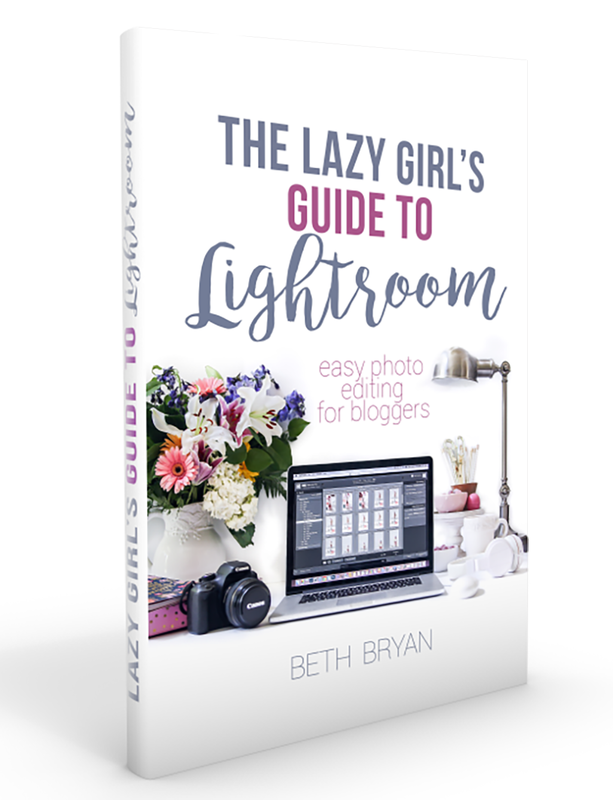 Looking for a great little gift to give to all the girly-girls in your life? 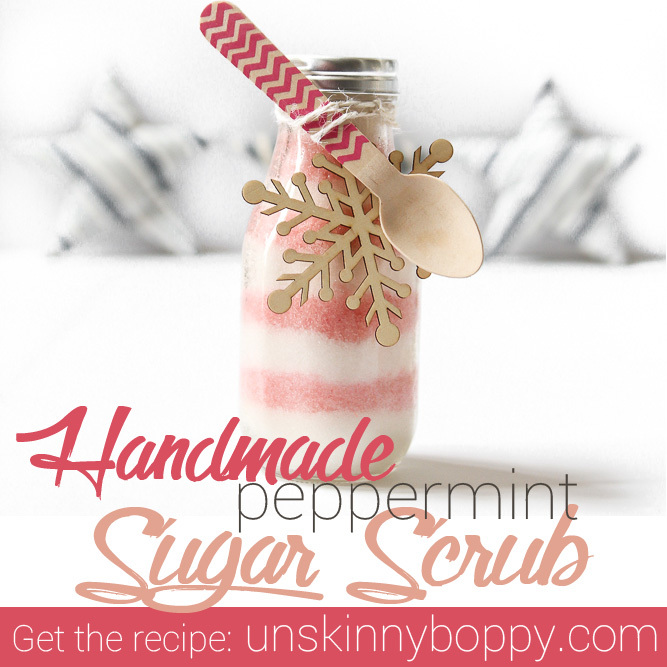 This layered peppermint sugar scrub recipe is perfection and it’s SO simple to make. Give this one to all the girlfriends, sisters, moms, grandmamas and teachers for a one-of-a-kind present that will knock their socks off. I saw this idea last year at my friend Jessi’s blog and LOVED it, so this year these are at the top of my list of DIY Christmas gifts. 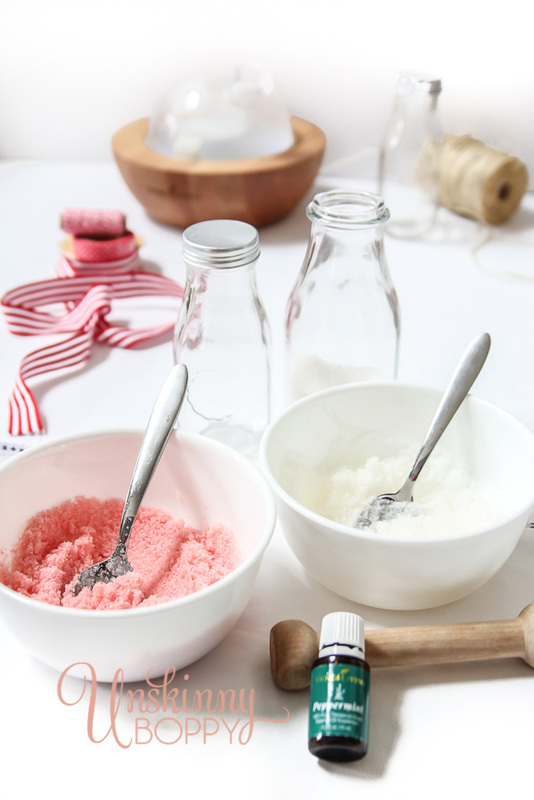 Divide the white sugar into two bowls, adding half the regular oil and half of the essential oil to each bowl. It should be the consistency of beach sand, so if it’s too wet add more sugar and if it’s too dry add more oil. No worries here–You don’t need to be exact. Mix food coloring into one bowl only. Spoon a layer of each color into a wide-mouth glass bottle. I got these at the Target dollar spot, but you could recycle a Starbucks frappuccino bottle. Whatever you prefer. 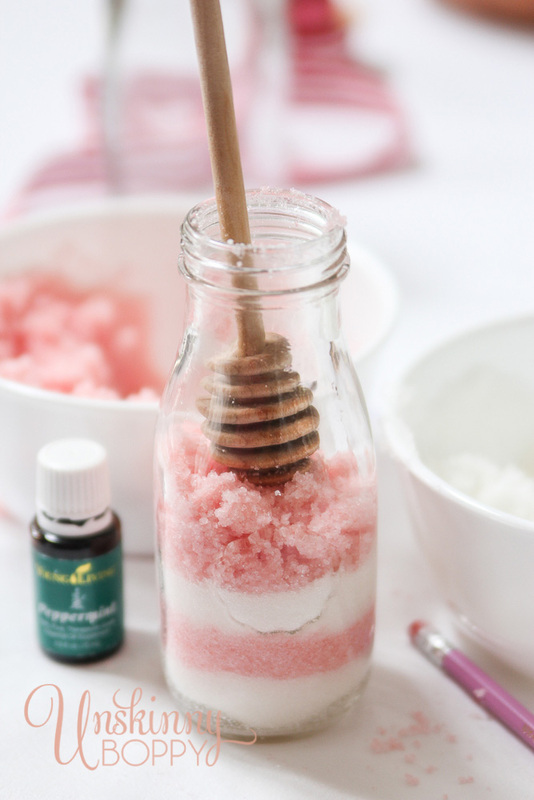 Lightly tap the bottom of the bottle on the table to get the sugar scrub evenly distributed, then use something like a honey dripper or a drink muddler to press each layer down firmly inside the glass. You can use a pencil eraser to scrape around the sides of each layer for cleaner edges. 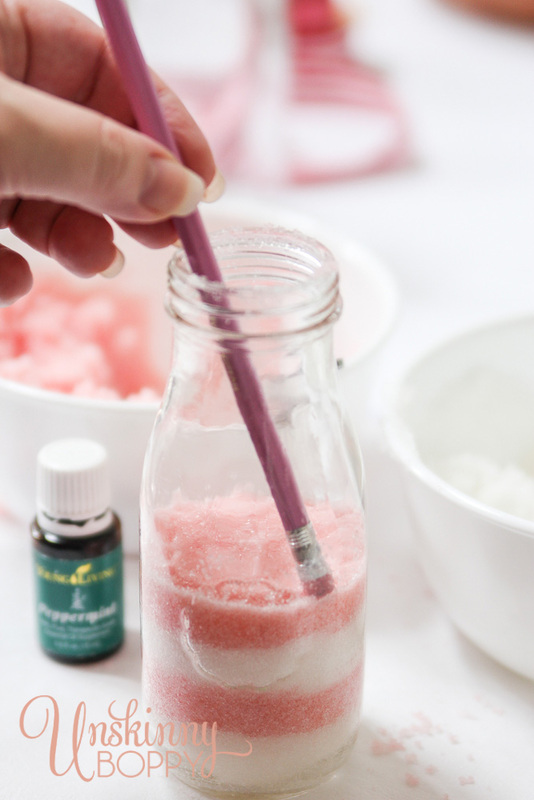 Make sure to use the same amounts of each color to get equal sized layers and gradually use less of each as your bottle gets smaller in the neck. I started out with two heaping tablespoons of each color layered in the bottom then one heaping tablespoon in the neck of the bottle. 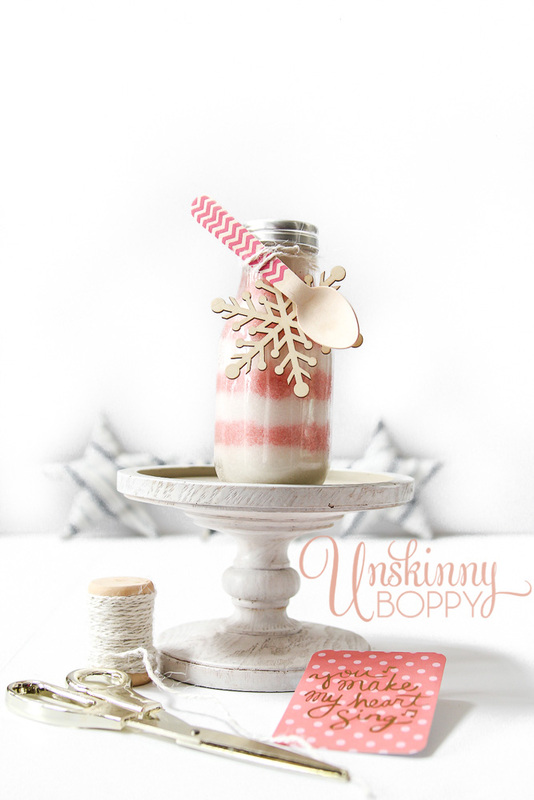 To finish off the presentation I tied a wooden snowflake ornament around the neck with twine and attached a chevron wooden spoon so folks can dip the sugar scrub out of the bottom of the bottle. And there you go! 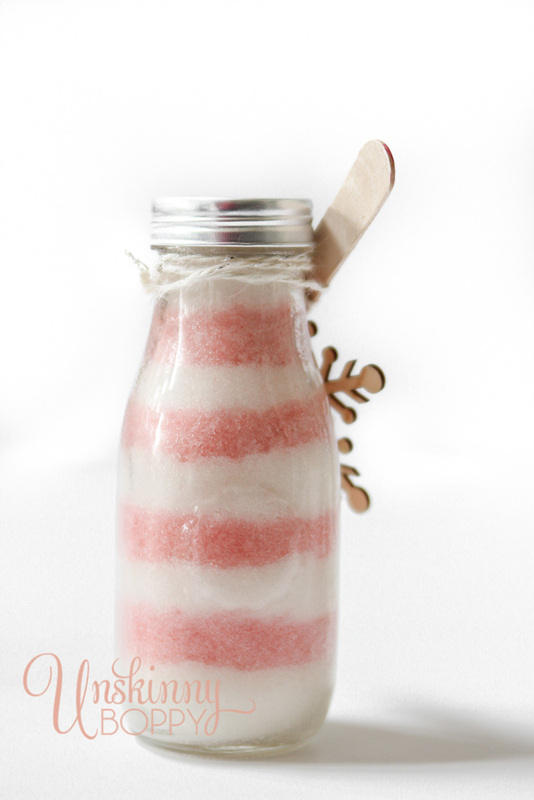 This is such a simple little gift to make for birthdays, Christmas, teacher appreciate or baby or bridal shower favors! Enjoy! That is adorable. 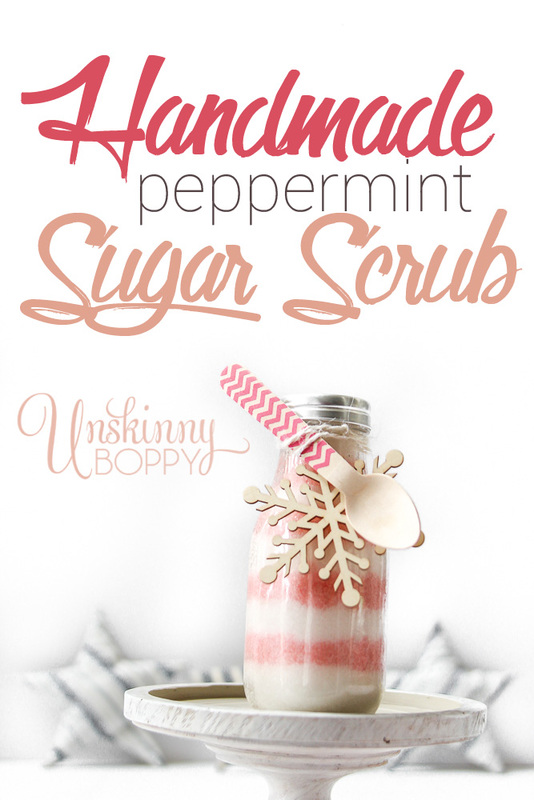 We try to make nothing but homemade gifts at Christmas, so this is going on my list of things to make. Thank you so much for sharing this! My daughter and I just made these, and they turned out great. Two and a half recipes filled three bottles. We are making beaded snowflakes to tie onto them. Thanks for the fun gift idea!